The ministry, through the Income Tax department, has already incorporated more than 1.75 lakh Aadhaar numbers in its database since it notified a new form 49A for getting PAN last year. 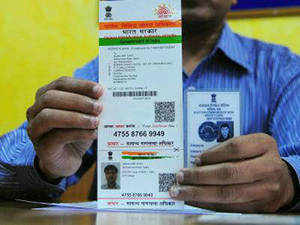 NEW DELHI: The Unique Identification (UID)Aadhaar number will soon be a “valid” proof of identity and address to obtain a PAN card.A proposal for inclusion of Aadhaar in the existing list of valid proof of identification and proof of address for allotment of PAN was sent to the finance ministry by the Unique Identification Authority of India sometime back. The ministry has decided to notify rules in this regard. It is aimed at curbing the menace of fake or duplicate PAN cards which are allotted by I-T department to taxpayers. “Once Aadhaar is accepted as a valid proof for obtaining PAN, the I-T department would be able to weed out the menace of fake, forging or duplication of PAN cards. “The amalgamation of the databases is in full swing and the ministry would soon notify the rules in this regard,” a senior finance ministry official said. It has been working for nearly three years on the plan of creating a biometric database of taxpayers which it will now achieve by incorporating the Aadhaar data which has been taken on similar lines. Till now, a variety of documents, like voter ID card, passport, driving licence and documents of owning or renting a property were used as a proof to obtain the Permanent Account Number (PAN). The ministry had last year brought out a new PAN application form– 49A for use of Indian citizens, companies and entities incorporated in the country which allows a applicant to mention his or her Aadhaar number. In 2006, the ministry had proposed that the biometric PAN cards would have the I-T assesses’ fingerprints (two from each hand) and the face. This will now be achieved by collating the Aadhaar database with that of the PAN. According to latest data (till December last), more than 16.49 crore PAN cards have been issued in the country.